Adult thrips are tiny (1-2mm long) slender insects with fringed wings. Immatures are similarly shaped with a long, narrow abdomen but lack wings. Most thrips range in colour from translucent white or yellowish to dark brown or blackish, depending on the species and life stage. The life cycle of thrips consists of five stages: egg, 2 larval stages, prepupa, pupa and adult. 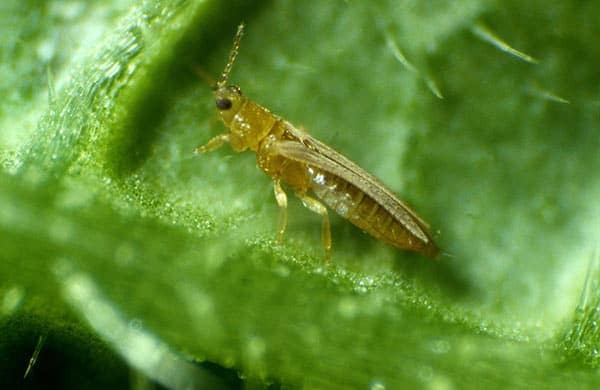 Female adult western flower thrips live up to 30 days and lay 2-10 eggs per day. At 20°C, development from egg to adult takes approximately 19 days. At 25°C, it takes 13 days. The eggs are inserted into soft plant tissues, including flowers, leaves, and stems. The larval stage consists of 2 instars that feed and develop on the leaves and flowers. The prepupal and pupal stages often complete their development on the ground or growing medium. The pupa is a non-feeding stage during which the wings and other adult structures form. The adults are weak fliers, usually taking short flights from leaf to leaf or plant to plant. Nevertheless, they disperse rapidly throughout the greenhouse. Adult thrips can be transported on wind currents and will enter the greenhouse through vents and doorways. At all stages they may be dispersed on workers' clothing and on infested plants, growing media or farm implements.